Whether you're getting your first tattoo or adding to your collection, you probably recognize that a tattoo is an investment. Proper care of a new tattoo is vital to keeping that investment looking good for the long-term. Good tattoo care is vital and just as important as choosing your design and tattoo artist. This goes for tattoo art as well as cosmetic tattoos. Nowadays, as long as you go to a reputable and professional facility, getting a tattoo poses very little health risk. The horror stories you may have heard about tattoo allergies or infections belong mainly in the past. That doesn't mean you don't have to be careful though – for maximum enjoyment and minimum grief, you need to follow certain tattoo aftercare instructions. You're all finished up and ready to show the world your new ink, but you'll have to wait just a little while. Your tattoo artist is going to cover that new tattoo, most likely with a thin gauze and bandage, to keep the area sterile and to aid in the healing process. Head home and relax a little. You can remove the covering after a few hours, per your tattoo artist's instructions. One exception to this rule: if your tattoo artist covered your tattoo with a plastic wrap, remove it as soon as you get home. 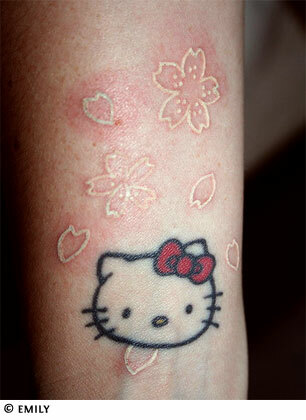 Plastic wrap is bad for your tattoo. New tattoo care is mainly a matter of keeping the tattoo protected. While your skin is healing, make sure that there is nothing rubbing against the tattoo. Depending on where your tattoo is, this may or may not be a problem. For example, if you have a new tattoo on your ankle, you might need to avoid wearing socks while it heals. For a tattoo on your lower back, make sure that the waistband of your pants is loose enough so that it doesn't rub. Wash your hands before removing the bandaging, and every time you touch your tattoo: this will greatly reduce the possibility of infection. Use a mild mild soap. Don't use a washcloth or anything abrasive. 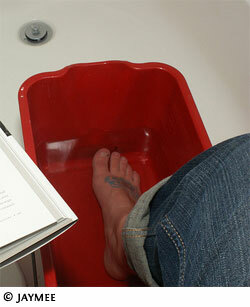 Splash the water onto your tattoo rather than putting it under running water straight from the tap. Be sure to remove all traces of blood. Pat dry with a paper towel or soft cloth. After washing, apply a thin layer of an anti-bacterial ointment. You can apply this ointment several times per day, especially if your skin feels dry or tight. Keeping the skin moist and supple will help to minimize scabbing or peeling, thus helping maintain strong color retention. Do not use alcohol or peroxide as these will dry your skin out and right now, moist is good. Continue washing your tattoo in this manner two to three times a day for the first week (more frequently if it's on your ankle or wrist, as these areas are more easily soiled). Your normal daily shower is fine but otherwise limit your tattoo's exposure to water. No swimming, no hot tubbing, no soaking in the bath. Chlorine can fade the colors of your tattoo, not to mention the added bonus of even "fresh" water potentially introducing bacteria into your skin, leading to infection. Another thing: no tanning! Excessive exposure to sunlight (or to the UV rays in a tanning salon) can fade the colors of the ink. If you do go out in the sun, keep your tattoo covered. Newly tattooed skin is too sensitive to be exposed to the summer sun unless it is protected, and sun exposure can also cause tattoos to fade before their time. Good tattoo care means putting your tattoo's needs first, at least for a few weeks. Let's face it. You've just poked your skin with needles, many times over. Your body is going to react in a perfectly logical fashion by bleeding. In the first days after getting your tattoo, there will a small amount of blood and other delightful bodily fluids seeping from the affected area. This is normal and manageable with good tattoo care. Ink may also ooze from the tattoo for the first few days. Again, normal. Wear loose fitting clothing that you don't mind getting ink on. Overnight, put an old towel down to avoid getting ink or blood on your bed linens while you sleep. Three to four days into your tattoo aftercare program, discontinue the anti-bacterial ointment and begin using lotion. Lotions that are fragrance free and dye free are your best bet (Lubriderm for example). Even if purchasing a lotion recommended by your tattoo artist, check the ingredients for anything you might be allergic to, like lanolin. There are commercial products designed specifically for tattoo aftercare , but check the ingredients list and consult with your tattoo artist before purchasing them. Apply the lotion after washing your tattoo, or anytime your skin feels dry or tight. Again, keeping the skin supple will help reduce scabbing and peeling . Don't forget to wash your hands before touching your tattoo to prevent infection. Your tattoo may itch as it heals but resist the urge to scratch. Lightly slap your skin, or apply some more lotion to alleviate the itching. Warning! : put down the petroleum jelly. Just walk away. Unless you want to fade the color in your new piece of body art, in which case, have at it. In general, don't use products that are greasy or will clog your pores. The tattoo needs air to heal properly. The risk of infection from a tattoo is nowhere near as high as it used to be, because the proper precautions are taken. Mainly this means that your skin will be sterilized before the tattooing starts, and most importantly, a new needle (not a ‘cleaned' or ‘sanitized' one) will be used. In this day and age, any professional will be well aware of these precautions, so you probably have nothing to worry about. Still, an essential part of tattoo aftercare is checking for infection. Signs of infection include red, inflamed, puffy looking skin and tenderness. A tattoo that is healing properly should not be tender to the touch after the first couple of days. If it seems to be getting more sensitive rather than less, or if there are any other signs of infection, it may be time to get it checked by a health professional. Cleanliness is important for the prevention of infection : always wash up before touching your tattoo. A little blood or ink seepage is normal. Wash your tattoo 2-3 times per day for one week. Apply an anti-bacterial ointment after cleansing for 3-4 days. Apply lotion after cleansing after the 4th day. Stay out of the pool, away from the beach, and off that tanning bed for two weeks . Most of all, heed the advice of your tattoo artist. Chances are he has had a little personal experience with tattoo aftercare, and can give you specific advice on how to care for your own new tattoo. Dealing with a new tattoo isn't difficult – it just requires a little effort from your side. Taking care of a tattoo will ensure that your ink is not a health risk, and that it will heal quickly. Following these tattoo care instructions can ensure a long-lasting and beautiful form of self expression.